Q. Why not use the chroma-key software including with my editing application? A. You can! Unfortunately, the composited output will simply not offer the fine details that your blue or green screen footage can offer. Ultimatte AdvantEdge almost always surprises users when compared side-to-side with chroma-key software. Fine hair detail, translucent glass, smoke, water, semi-transparent fabric, and shadows (seen in the image below) are only a few of the ways that Ultimatte AdvantEdge will shine when compared to chroma-key software. Take a look at the following example, which is a single frame from a standard definition production from Virtualsets.com. It shows the amazing level of detail that can be achieved with subtle shadows on a good, but certainly not great blue screen. As you mouse-over the image, notice how the subtle shadows seen on the blue screen remain in the final composite. Even those super-dark areas under the chairs composite well. Even the most minimal shadows that are cast by the screen-right chair at the bottom of the frame come through on the final composite. These are the details that the Ultimatte AdvantEdge plugin will allow you to achieve in your blue and green screen work. Click here for more examples of the AdvantEdge plugin in action! Q. I use both After Effects and Avid DS. Do I need two copies of the plugin to do this? A. No! This is another of the great features of the Ultimatte AdvantEdge licensing agreement. One license can be used for all supported applications on one system. Q. I use the Adobe CS5 applications. Can I use Ultimatte AdvantEdge with CS5? A. No. Adobe CS5 is incompatible with Ultimatte AdvantEdge. AdvantEdge works with Adobe CS4 and earlier. Q. I use Final Cut Pro X. Can I use Ultimatte AdvantEdge or Ultimatte RT with FCP X? A. No. FCP X is incompatible with Ultimatte plugins. Q. I use Max OS X Lion (OS X 10.7). Can I use Ultimatte AdvantEdge or Ultimatte RT with Lion? A. No. OS X Lion incompatible with Ultimatte plugins. AdvantEdge and RT are compatible only with versions prior to OS X 10.7. Q. Will the Ultimatte plugins work on multi-core systems? A. Yes. However, AdvantEdge will not run on computers with more than 8 cores. Q. What is Ultimatte RT? A. Ultimatte RT is a GPU-accelerated version of the AdvantEdge plugin, with a much simpler interface. The Ultimatte RT plugin uses the FxPlug capabilities of Apple Final Cut Pro and Apple Motion. It uses the same Ultimatte-patented algorithms as the AdvantEdge software. Q. I use Final Cut Pro and Motion. Should I use AdvantEdge or RT? A. Ultimatte AdvantEdge should be used when the footage has some flaws, such as when the footage is recorded in DV format, the blue/green screen is uneven, or there are some other problems. Ultimatte RT is a great tool for time when the footage is clean doesn't have these types of problems. Because the full AdvantEdge plugin has many more options, tweaks, and settings available, including specific settings for DV footage and the amazingly helpful "Roto-screen correction," AdvantEdge is best for problem footage. If you have clean footage without these types of problems, Ultimatte RT is the best option, simply because of the GPU-accelerated renderer. The majority choose to have both tools at their disposal, since both licenses can be purchased as a package/bundle at a discount. This allows you to access the quick rendering potential of Ultimatte RT when possible, but having Ultimatte AdvantEdge when you need it. Q. I want to use the AdvantEdge software on both my PC and with Final Cut Pro on my Mac. Can I do this? A. Yes. The licensing agreement allows you to install the software on any computer. Simply plug in the USB dongle to activate the features of the Ultimatte software. The software for the PC and the Mac uses the same USB dongle. Of course, only one computer can use the software at a time. To use both your PC and your Mac simultaneously, you will need two licenses. Q. Since I plan to use AdvantEdge with more than one program, will I need to learn the differences in the Ultimatte interfaces from one application to the next? A. No! The Ultimatte AdvantEdge plug-in has EXACTLY the same interface in all host applications. Q. Is AdvantEdge compatible with Adobe CS5 Applications? A. No. Adobe CS4 is compatible. CS5 and CS5.5 are not. Q. Is AdvantEdge compatible with Intel Mac-based systems? A. Yes. Check the "Compatible Editing Apps" page for all of the details. Q. How soon can we receive our copy/copies of Ultimatte AdvantEdge? A. Unlike most every other AdvantEdge reseller, we keep a supply on-hand. We should be able to accommodate most next-day delivery requests. We can even offer same-day service in the Los Angeles area! Q. What is the price for the Ultimatte AdvantEdge plugin? A. The MSRP is $1,495. However, we knock a significant amount off of that price AND offer FREE shipping to the USA! Our goal is to offer the lowest prices anywhere. We believe that our current prices are the lowest anywhere. Click here for our current prices. 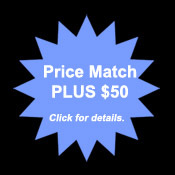 If you find an Ultimatte Authorized Reseller offering a lower price, be sure to check out our Price Match PLUS guarantee before placing your order. Q. Why purchase direct from this site, instead of a local dealer/reseller? A. We offer the lowest price. We always have the plugins in stock, so we can almost always ship the same day as your order. Free shipping to the USA. Also, free phone and e-mail support - for life! A. Yes. Please call or e-mail us for the details. All content ©2007-2011 Ultimatte Corporation or Virtualsets.com, Inc. All rights reserved.